The Cop Show is an idealised representation of police work, justified by the Rule of Cool. Morality is very black and white, being a cop is far more dangerous in this genre than it really is, shoot-outs and standoffs are common, as are car chases and Serial Killers. The protagonist is often a Cowboy Cop who often get their man (even if not the first time). Of course, they don't forget the niggling details of the job, either. Specific variants: Buddy Cop Show. The more realistic representation of police work in fiction is a Police Procedural. See also and compare with: Criminal Procedural, Forensic Drama, Law Procedural. Disney also made a send-up of this with Fillmore!, which follows the adventures of a middle-school safety patrol. Ghost in the Shell: Stand Alone Complex, to an extent. G-Men '75, a Japanese police show detailing the investigations of seven government-appointed Hardboiled Detectives. Starred Tetsuro Tamba (Tiger Tanaka from You Only Live Twice) and became quite popular (thanks to its classy opening, replete with Awesome Music and Power Walk), resulting in a short-lived Sequel Series, G-Men '82, as well as 3 Reunion Show specials. Kaitou Sentai Lupinranger VS Keisatsu Sentai Patranger, specifically the Patranger half. Seibu Keisastu (Western Police) - A Japanese cop show that featured over the top-action rivalling the standard 80s action movie and accordingly starred some of Japan's most famous Action Genre Hero Guys. Tokuso Saizensen (Special Investigation: Frontline), a Japanese cop show that ran for ten years and had Hiroshi Fujioka of Kamen Rider in the cast. It also ran heavy on human drama in addition to the cop stuff. 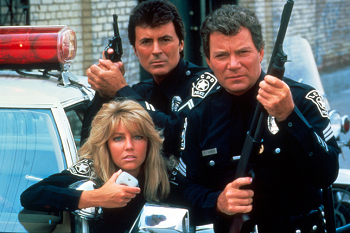 Police Squad!, Sledge Hammer!, and Angie Tribeca were parodies.